Blackjack is the invention of Jonathan Brown, former President of the Agility Association of Canada (AAC) and is a now defunct titling game for Canine Performance Events (CPE). Blackjack can still be played as a titling game in the TDAA or TopDog. Blackjack is a game of strategy and agility. The Vegas variation of Blackjack is possibly more exciting and challenging than the original version. The purpose of this game is to accumulate 21 points in the fastest time. Accumulating more than 21 points disqualifies the team. At least one corner, one side, and one jump must be completed successfully. Corners are typically made from tunnels placed in the corners of the course; sides are always contact obstacles and weave poles which are placed along the sides of the course. The jumps are arranged in a random fashion in the middle. No contact obstacles may be taken back-to-back. At least one obstacle must be taken between contact obstacle attempts, whether successful or not. Four-paws are required for commitment on any obstacle. No obstacle may be successfully performed more than twice for points. Dogs shall accumulate points within a time period established by the judge, usually sixty seconds. If 21 points are accumulated under the time limit set by the judge, the dog and handler go to the table to stop time. Blackjack is scored points then time. The highest point value wins. If two or more dogs have the same number of points then time breaks the tie. A team scoring over 21 points is eliminated. This is an example of a typical Black Jack course. This Blackjack course includes the table (near the center of the course), which is used to stop the clock. The table is near 6 to 8 single-bar, non-winged jumps. The contact obstacles and weave poles will be arranged on the outer perimeter of the course. The four corners include a collapsed tunnel, a pipe tunnel, a tire or window jump, with the fourth corner being another tire or pipe tunnel. In the Vegas variation two distance challenges are included in the course. After the traditional point accumulation, the team may attempt one of the two gambles on the course. The Ace gamble is worth 11 points, is noted on the course in white numbers. The Blackjack gamble is worth 10 points indicated on the course in black numbers. A successful performance of a gamble will not be required for the purpose of qualifying. However, if the dog goes over-time in getting to the finish line after the performance of the gamble, then the bonus for the gamble is lost. Further, if the dog incurs a fault during the attempt of either gamble, then the gamble bonus is lost. This is an example of the Vegas variation of Blackjack designed for play with big dogs. The course was designed by Becky Dean. • Ace Fault – In a variation on the Vegas variation, if the dog faults the Ace gamble, he receives only one point (providing the dog succeeds in performing the first obstacle without fault), regardless of the number of obstacles completed in the gamble. It is important in Blackjack to make a good estimate as to the quickest way for a given dog to earn the necessary 21 points. Aside from the obstacles required to be performed, and the prohibition against back-to-back performance of contact obstacles, the handler must take into account the specific strengths and weaknesses of his dog. 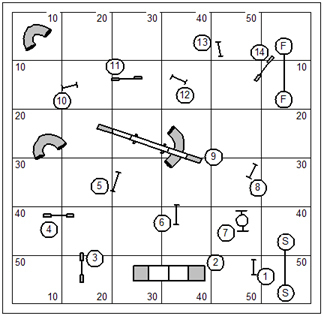 The handler must also have the ability to add up the point values of the obstacles to arrive at an even 21 points. 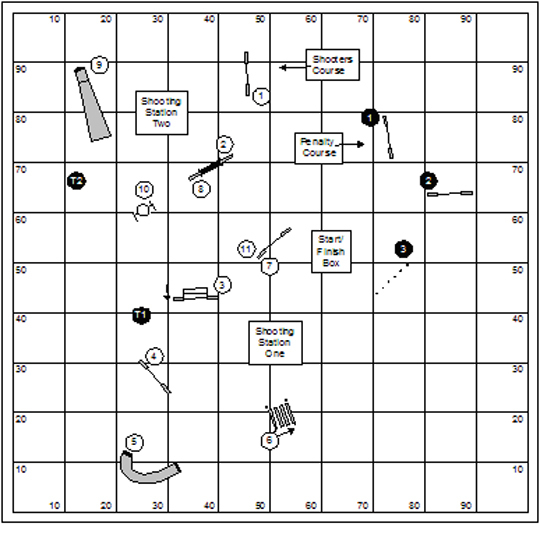 If something goes wrong on course, the handler will have to change the plan, but still do the arithmetic to arrive at 21 points. In the Vegas variation, the handler’s ability to keep the math straight will be somewhat more difficult. If the handler attempts a gamble, but fails because of an off course or a refusal, the dog will earn the simple value for the obstacles completed, but not the gamble bonus. According to the rules, the handler is eliminated for going to the table with more than 21 points. The handler probably should attempt each gamble, straight away. If the dog completes one of them, the dog earns the full points. If the dog fails at one, then he needs to fill the 21 points after the dust settles on the two gambles. This means the handler is going to have to be pretty quick on my feet (or doing math in his head). • Redux ~ In the original version of the game the judge would specify the beginning obstacle at the start of the class. The order of subsequent obstacles is the handler’s choice. The first obstacle must be attempted, if not, points are deducted from the dog’s score double the value of the opening obstacle. We’ve moved away from this definition because specifying the starting obstacle creates a limit on possible strategies in any dog’s choice game. • Vegas variation – This is the invention of Becky Dean. Two gambles are included in the course. After the traditional point accumulation, the team may attempt one of the two gambles on the course. – The Ace gamble, worth 11 points, is noted on the course in letters (tunnel, tunnel, dogwalk). 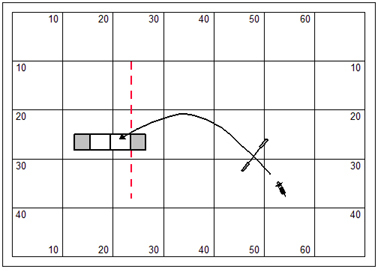 USDAA advanced rules will be used to judge the Ace gamble (only refusals on the contact obstacle only will be called). 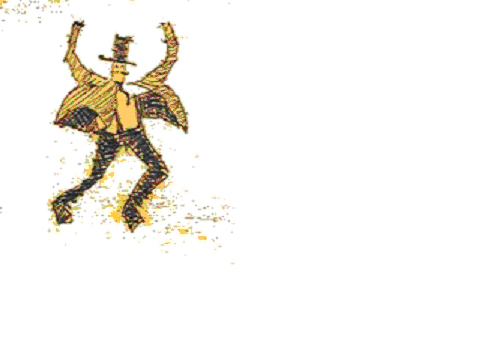 – The Blackjack gamble is noted on the course with numbers (jump, jump, jump). USDAA masters rules will be used to judge the Blackjack gamble (refusals for any obstacle). If the dog successfully completes jump, jump, and then incurs a refusal at the dogwalk, but then successfully completes the performance of the last jump, the team will earn 3 points (rather than 10). If the dog incurs a fault during the attempt of either gamble, he’ll earn simple points for the obstacles completed to that point, but will not be able to earn the gamble bonus. No more than one obstacle in either gamble can be performed back-to-back except when attempting the gamble. However, one obstacle from the ace gamble could be performed in conjunction with one obstacle from the Blackjack gamble without incurring a penalty. If more than one obstacle in a gamble is taken back-to-back, the team will not be eligible to earn the gamble. Gambles can be completed at any time during the run. A branch of American military service once used a leather collar as part of their combat uniform to protect the combatant’s neck from saber cuts. The leather collar resembled the seal used in canning fruit and vegetables. This accoutrement of the uniform helped create at least two nicknames for servicemen of this branch. What is the branch? What are the nicknames? Two by Two is the invention of Deb Auer… with respectful nods to all the other relay-type games out there. This is a team relay game that can be played by any number of teams and two or more members on a team. The objective of Two by Two is for the team to perform all the obstacles on the course in sets of two, without repeating obstacles. Dog and handler teams start anywhere behind the start line. Jumps are set for the shortest team member. Time starts when the first dog on course crosses the start line. All handlers may lead out. The table stops time. Each dog is directed to cross the start line and perform no more than two obstacles. Once the first dog has re-crossed any of the three start lines, the next dog may start, performing only two obstacles and crossing any of the three start lines. Play continues in this manner until all of the obstacles have been performed once. When all obstacles have been performed the last dog must be directed to the table to stop time. The inactive dog may be repositioned anywhere outside of the containment lines while the active dog is on course. Big dog teams will have 50 seconds; small dog teams 55 seconds. Two by Two is scored time plus faults. If a dog faults an obstacle the handler may either accept the performance fault (eg. 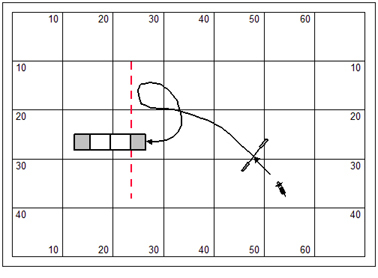 5 faults for a missed contact) or can retry the obstacle to erase the fault; for a dropped bar the handler or one of his teammates may reset the bar so it can be reattempted. Two by Two is judged using the guidelines for performance faults as defined in the rules for standard classes. Refusals are not faulted. 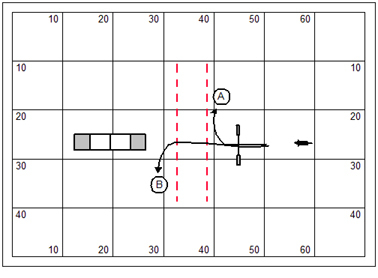 5 faults ~ Performing an obstacle that has already been performed; note that a repeated obstacle will count as one of the two a dog is entitled to perform, vastly complicating the strategy of the team. 5 faults ~ Crossing the start line before the active dog has completed his turn; unless the dog has not taken any obstacles and the handler takes the dog back behind the start line before restarting. 10 faults ~ Failure to perform an obstacle. Two by Two begs for a random arrangement of obstacles on the field. 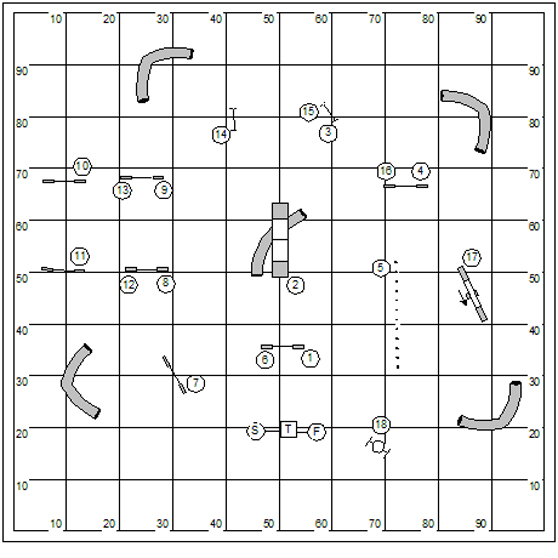 It is reasonably impossible to practice skills from any other course or game: so this is a great game for using the set of the floor from a standard course or nearly any other agility game without equipment movement or tweaking. 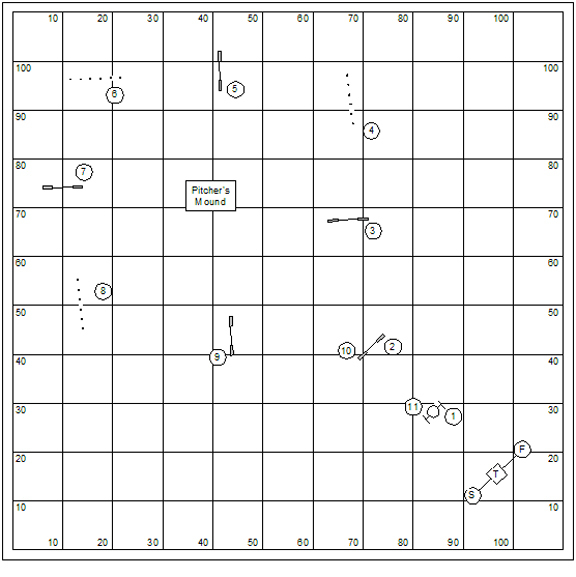 The discussion in the rules above mentions three start lines; but the game might be played with only two start lines or maybe as many as four. There may be some difficulty in defining lines that judge can see from a mostly stationary position. However the judge could loosely define the confinement of the inactive dog by stipulating “out to the side” or “beyond” without scrupulously drawing lines around the field. Teams should collaborate on which dog is going to take what obstacles and the order of that taking. It is probably to the team’s advantage to have the more novice dogs do the sequences on the outside edge, as there will be fewer off-course possibilities. However, even the best-laid plans often go awry. If a dog goes off course (takes an unintended obstacle), it will surely affect his teammate’s plans. All things being equal this game is likely won by the team that devises a plan that minimizes both the transitional distances between obstacles, and the distance between the start line and the obstacles to be performed. It would be a good idea to devise a plan that reflects each dog’s relative strengths and weaknesses. Redux ~ The rules of the original version required any faulted obstacle had to be repeated until successfully completed. Consider playing the game with teams with more than two dogs. It could be played with three dogs, or seven. It’s not really necessary for the number of obstacles on course be a strict multiple of the number of dogs on a team; but it wouldn’t hurt. Also, consider each dog doing more than two obstacle on his turn. It might just as well be three. The real difficulty in this game is how to pass good information to the score-keeping table. How does the judge indicate that an obstacle has been repeated? The mind like a steel trap method is really quite difficult in this game. The judge would have to keep track and count of performance on every obstacle. In the illustration above obstacles have been numbered for the convenience of the judge. So all the judge really has to do is call out the number for each obstacle performed. The score-keeping table will sort out the bodies. Though be aware, any game that requires the judge to call out numbers raises the possibility of scribing errors. The team qualifies when the final score (Time Plus Faults) is equal to or less than the Qualifying Course Time (QCT). The QCT should be based on a reasonable estimate time for the team to get the job done. An easy way to establish QCT would be for the judge to measure a course reflecting a reasonable strategy and then using the rates of travel from the standard classes. What is the most important connection between these two people? There are several scenarios for determining when a dog has committed a refusal on a contact obstacle. I’ll attempt to be comprehensive in this discussion. This discussion is more or less limited to understanding performance in the TDAA. A refusal is called for “turning away” from the approach. Most rules for performance attempt to define this type of refusal as the dog turning away after having begun the approach. In general this is a matter for judge’s discretion. The question really is whether the dog begun the approach before he turns away. To make matters a bit simpler we’ll use Woz’s “Rule of Thirds”. Divide the space between the obstacle shaping the approach and the contact obstacle: In the first-third, the judge will not call a refusal for turning away; the dog has not begun the approach. In the third-third the judge will absolutely call the refusal; the dog has certainly begun the approach. In the second-third, however, it is a grey area matter for the judge’s discretion. If you thought you were going to get out of this without exercising judgment… sorry to disappoint. 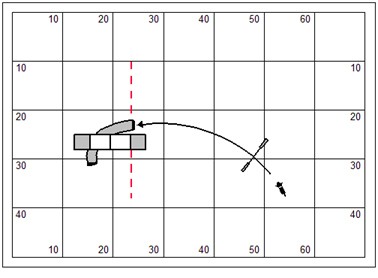 Another important type of refusal is stopping or hesitating on the approach to the contact obstacle. Typically rules for performance define this as a “significant” hesitation on the approach. For the stopping refusal use Woz’s Rule of Thirds for determining this refusal call to answer the having begun the approach question. Some judges pull the trigger on this call far too quickly, often calling a refusal even when it’s clear that the dog is just slowing to gather his feet under him. The litmus I want to use is “significant”, and in this context: If you can say the word “significant” in a nice slow southern drawl and the dog is still stopped… then it is a refusal. If, however, all you can get out is “sig…” then it is not a refusal. And certainly going slow is not a hesitation at all. The dog should not earn a refusal no matter how slowly he makes the approach. By the way, the TDAA’s rule of four paws for commitment is important in this discussion. If the dog gets to the A-frame and puts two feet up on the ramp and stops, then a significant hesitation will incur a refusal penalty. In the USDAA (at the Masters level) the two paws on the ramp would constitute commitment, and no refusal should be called because the dog has begun the performance. 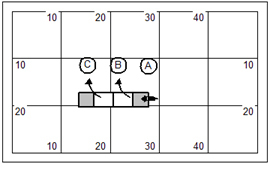 The Runout refusal is called when the dog passes the back plane of the contact zone. This is relatively straight-forward. It’s possible that the dog could get up onto the contact obstacle while crossing the run-out plane. The judge should not double penalize the dog for both a missed contact and a refusal. Note that the up-contact is judged in the TDAA only in the case of a side mount, as in this illustration. When the tunnel is used under a contact obstacle the dog would not be called for a refusal if he’s actually in the tunnel when crossing the run-out plane. Of course this would be called a wrong course; but not both a wrong-course, and a refusal. If the dog clearly has to pass through the run-out plane before committing to the wrong-course obstacle then both the refusal and the wrong-course penalties would be assessed against the dog. In the USDAA and probably in the AKC this would be called a refusal, because the dog has run past the approach to the A-frame and turns away from the obstacle rather than towards it. In the TDAA, however, this would not be called a refusal because a) the dog never began the approach and b) the dog did not cross the run-out plane. The refusal comes into play in the performance of all the contact obstacles after the dog has committed. All three need their own discussion. This will sound repetitive… A) if the dog commits with two paws and significantly hesitates, it is a refusal. B) If the dog bails from the ascent ramp after having committed all four paws, it is a refusal. C) If the dog jumps off the center plank in the TDAA it is a Failure to Perform (unsafe performance); in the USDAA this would be a refusal. D) If the dog jumps off the down ramp without touching the down contact, it is a missed contact only. A) If the dog commits with two paws and significantly hesitates, it is a refusal. B) If the dog bails from the up ramp after having committed all four paws, it is a refusal. C) If the dog jumps off the down ramp without touching the down contact, it is a missed contact only. B) If the dog bails from the ramp after having committed all four paws ~ and the plank does not move ~ it is a refusal. C) If the dog bails from the ramp after having committed all four paws ~ and the plank moves; and does not touch the ground ~ it is a fly-off. D) If the dog bails from the ramp after having committed all four paws ~ and the plank moves; and touches the ground ~ no call, so long as the dog demonstrated control of his movement. 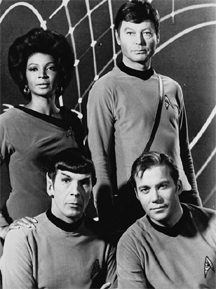 What was James T. Kirk’s paternal grandfather’s name? You know, I’ve erred from time to time in curriculum design that I might make a thing more technical than necessary. 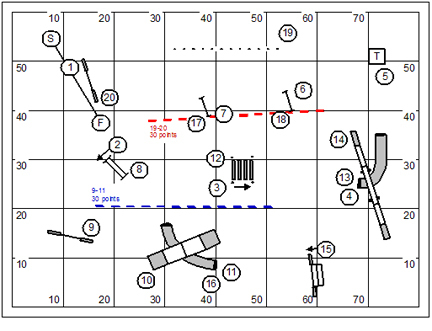 By extension the course designer might design a course for competition that is more technical than necessary. How evil can one be in a numbered sequence of 20 obstacles? Here’s a warmer-upper sequence that I put in our Sunday workshop. Warmer-upper has to mean a simple not-very-challenging stretch to get everybody warmed up. But you know, sometimes the simple stuff can lead to a discussion of fundamentals, at least as I understand them. Why would a handler make this complicated? It’s a human frailty that boggles. The dog turns most naturally in the direction of the handler. So the intrepid handler will dispose himself to the side of every turn. The sequence turns initially to the right, and then subtly to the left. That’s just getting into the pipe tunnel. Out of the pipe tunnel the path turns with a moment of drama to the left, then turns right, and finishes with a left turn. So here’s the question for you. How does the handler truly position himself to the side of every turn? The handler who can a) answer the question and b) get it done… is the master handler. The simple bootlace configuration can be used to conduct the “parallel path” test. A dog tends to work in a path parallel to the handler’s path; it’s one of the laws of a dog in motion! And this should be true at a distance as surely as it is true when the handler is hugged up against the dog’s path. 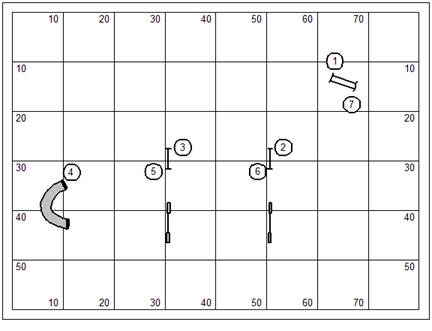 So in this sequence the handler will stay to the opposite side of the red line while the dog does jumps #5 and #6 away. The sequence concludes with a bit of technical handling. This is a fine mix of objectives in a training sequence. These two men share an interesting record in football. What is it? Show restraint unto others as you would have them show restraint unto you. Hello all. My recreation was football today, and old movies. I’m a sucker for both. Oh, and I had to do a bit of research to document Ralphie’s Run ‘til You Drop. This will evidently be a game played at the 2011 Petit Prix. And it looks like a lot of fun. It’s probably a variation of Just In Time. In an interesting twist the dog time ends after doing the teeter. You get it? Run ‘til you drop (the teeter). I guess I’ll be spending the Spring and Summer calibrating Hazard’s working speed. Also known as “Ralphie’s” Run ‘til You Drop this game is a variation of Just In Time with a grand bonus for correctly estimating the dog’s rate of travel. The objective of Run ‘til You Drop is to score as many points as possible the time allotted. The obstacles can be taken in any order and direction. The teeter has no point value and must be performed as the last obstacle; hence the name of the game. If your dog crosses the finish line before time expires, then all of the dog’s points will be doubled. Otherwise, there’s no penalty for going overtime, except that the dog cannot earn the bonus. Your job is to determine how many obstacles your dog can successfully complete within the time allotted. If you complete the teeter before the whistle blows, your score will be doubled. Big dogs have 50 seconds; small dogs have 55 seconds. This Run ‘til You Drop course is based on a TDAA course designed by Marsha Nix for play at Happy Feet K-9 Agility, June 12, 2010. This Run ‘Til You Drop course consists of jumps, tunnels, weave poles; and the teeter. What was the breed of the dog in the tear-jerker movie starring that old guy from The Real McCoy’s? It has been a tough week. Mostly I’ve been in loopy land which is surely the outfall of the concussion I got in the car accident last week. I have a terrible pain in my lower back that is soothed only with the assist of a low end narcotic. I wasn’t even going to fill the script being high minded about drugs and all; but yesterday I really couldn’t stand it anymore and I went to the pharmacy. In the mean time my computers have been misbehaving. I have one down in the shop; and one at home that is temperamental. I’ve upset my calendar somewhat, canceling agility play with my pups this weekend, and a handling seminar next weekend. Already lost was an important meeting with the TDAA IT guy and picking up TDAA property in IL (that’s why I was hauling across country pulling a trailer in terrible weather in the first place). I also have a ton of personal notes that I should respond to… well-wishers for the most part. I don’t want any of ya’ll to think I’m thoughtless; it’s more like mindless. A concussion turns the brain to mush. And I find myself losing tangible grasp of daily priorities small and large. To give an example, I might be in the midst of making a pot of coffee, and though I’ll have the carafe in one hand and coffee filter in the other a moment will come upon me in which I wonder at what it is I was getting ready to do. Okay… just to prove that I can do this stuff in my sleep (an apt description of my wide awake mental condition)… I’ve continued with my review of agility games below. Biathlon gets a very brief review. The game mostly served to remind me that “alphabetical” is really the wrong organization for the games book. I need higher level categories that separate games we shouldn’t play for serious qualifying/titling purposes from those games that are fun, ridiculous, and not ready for prime time. And trust me on this note… any game that involves chucking tennis balls in the context of agility is somewhere is a loose range between fun and ridiculous. Black Hole however, deserves a very serious review. I’ve wanted to do this review for quite some time. This is one of our Crazy Ilze games (games invented by Ilze Rukis) and is quite a popular game in the TDAA and likely will be in the Top Dog TOP SECRET venue. The game has over time mutated by the rational test of real competition; and so I’m retiring many of the original rules for the game to a note under Variations. The basic rules of play have been rewritten to reflect how the game should be played today. The changes in rules to Black Hole don’t really alter the purpose or strategy of the game; but make scoring more rational. This game, the invention of Stuart Mah, was the runner-up in the 1995 Clean Run magazine games contest. Biathlon is modeled after an Olympic event that tests a variety of skills in athletic competition. A side consists of two dog and handler teams: a shooting team and a penalty team. Both teams on the side begin in the start box. The shooting team begins a sequence designated by the judge in which two areas are marked shooting stations. Both dog and handler of the shooting team must remain in the box, as the handler tries to knock over a target with one of three tennis balls (ammo) supplied at the shooting station. If the handler successfully knocks down the target, the team continues on the shooting course. When the first team completes the course the penalty team becomes the shooting team and must complete the shooting course in the same manner as the first team. • Any time the shooter’s dog leaves the shooting station before the ammo has been exhausted. If the dog running the penalty course incurs obstacle performance faults, those faults are added to the side’s course time. Any obstacle omitted in the penalty course will incur a failure to perform (20 faults). If the dog on the penalty team leaves the start box or the penalty course to pick up loose ammo, there is no penalty other than the time it takes to get the dog back under control. If the shooter fails to knock down a target in three tries, a special penalty is assessed. A special penalty means the handler on the penalty team must run the assigned penalty course. During the course run, ammo that is dropped by the shooter will be considered unusable and must be left on the field. There is no penalty if a dog picks up and carries ammo on the course. However, this ammunition is considered unusable by the shooter. Handlers who are not on course may hold onto their dogs. Biathlon is scored time plus faults. The side with the lowest score wins. Biathlon is not a game that should be used for titling purposes in any venue. The tennis balls add a complexity that creates a competitive disadvantage for certain types of dogs. And throwing the tennis balls can only lead to carnage and chaos. The shooting course should be designed using 9 to 12 obstacles and should be appropriate to the level of the dogs. Use mainly jumps and tunnels and occasionally, weave poles or a contact obstacle. The penalty course ideally consists of no more than 2 or 3 obstacles and for the purposes of the special penalty, should not include contact obstacles. The target is placed 10 to 15′ away from the shooting station. Some possible targets are a tire with a net on the end to catch the ball or soft dog toys set on a table or other suitable surface. 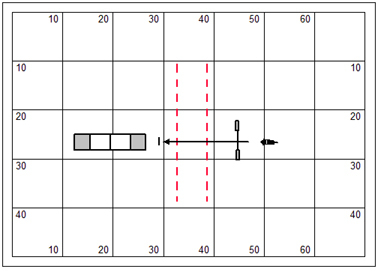 In addition, if hitting the target will be difficult to judge, it is advisable to use jump stewards as target judges. They can signal with a flag if the target is hit or not. 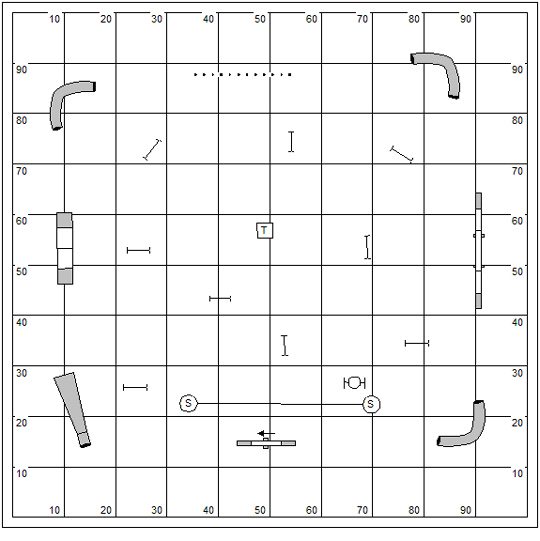 The shooters course, shown in white numbers, uses 9 to 12 obstacles. The penalty course, shown in black numbers, uses 2 or 3 obstacles. The targets are labeled “T1” and “T2.” This course was designed by Stuart Mah. • Hurry Up and Wait – In this variation of Biathlon, a typical two-dog Relay course is run. In each leg of the Relay is a shooting station, equipped with six balls and a target. The handler on course must pause at the shooting station and attempt to hit the target. The shooter can proceed on course only after hitting the target or exhausting all of his ammunition. 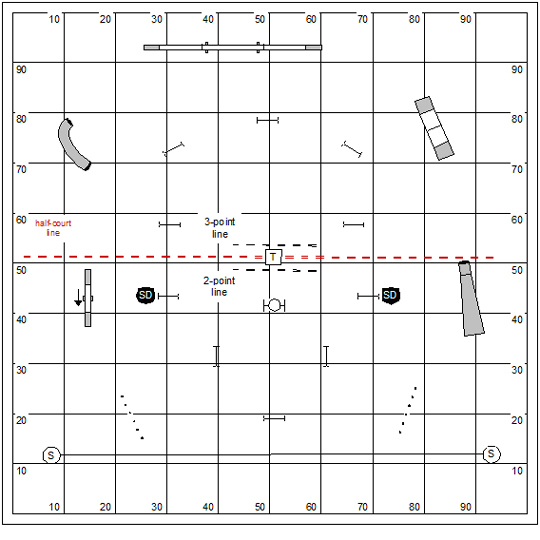 • Single shooting station – The Biathlon shooting course can be reduced to one shooting station. • Alternative penalty course – There may be two different penalty courses set: one course for the dogs and one course for the handlers that is more handler friendly. Black Hole is the invention of Ilze Rukis, who was looking for a different ‘spin’ on the usual agility game. She created a game in which the focus is not to take a particular obstacle. What could be better than the ever-inviting tunnel opening that so many dogs just love to dive into? The game is intended to help to develop discrimination and control skills of the handler. Black Hole is like a standard course. The handler will direct the dog on the numbered course. The dog can continue to earn points unless the dog goes into a pipe tunnel (the black hole). Scoring stops once the dog goes off-course into a tunnel. Rules for performance faults are slightly abridged for this class. A wrong-course (other than into a tunnel) is not faulted. Refusals are not faulted; however, the handler must correct the error or earn failure to perform. If a dog goes into a tunnel with all four paws he has fallen into a Black Hole and is eliminated. At the handler’s discretion the dog may finish the course. Black Hole is scored Time plus Faults. The Qualifying Course Time (QCT) is established using the rates of travel from the standard classes respective to the level and the jump height of the dog. The dog qualifies by earning a score equal to or less than the QCT. This is an example of a Black Hole course. Note that the benchmark time for earning the bonus points is based on an arbitrary yards per second calculation. This course is about 160 yards long. The 50 second benchmark would be based on something better than three yards per second. The Black Hole course should be designed to suggest a logical path to the dog that presents on-course tunnels as inviting opportunities to the dog. These teasing options should be presented with some frequency. The Black Hole (wrong course) tunnel might be presented as an option which is loosely defined as a course that makes more sense to the dog than the course the judge actually numbered. The option is typically presented in the dog’s turning radius and possibly is framed to the dog’s attention before the turn begins. The option might also be the presentation of the tunnel as a discrimination with the tunnel along-side the correct obstacle (as in, tunnel under the dogwalk or A-frame). Black Hole course design for TDAA is comparable to course design for the big dog venues; though the transitional distances between obstacles is considerably tighter. The designer should be careful to provide a minimum of 12′ for the avoidance of any wrong course obstacle… and the pipe tunnels in a Black Hole course should be given the same thoughtful spacing. The handler must have room to solve the riddle of direction. The chief reasons that a dog goes off course into a pipe tunnel are that the handler has logically presented the tunnel to the dog or that the handler worries so over the potential for an off course at the tunnel that his body gives inadvertent “focus” to the tunnel. Where you have a tunnel-sucking dog, you usually have a tunnel-sucking handler. The handler might “trust the force” of his own movement while moving confidently and reliably in the direction of the true course without giving the tunnels much attention. On the other hand, the handler could also seek to create a path for the dog that does not present the pipe tunnels logically to the dog. Since this is a Time, Plus Faults game, the handler should be careful not to have a let down for any fault on course (other than the dog going into a Black Hole); because the dog can recover from a fault and still qualify. • Original ~ In the beginning Black Hole was scored points plus bonus then time; giving 1 point for jumps; 3 points for the tire or 6 weave poles; 5 points for contact obstacles and 12 weave poles. And, the dog earned a bonus of 10 points for doing this course in 50 seconds or less. This concept has been moved aside. It frankly makes little sense for a judge to be yelling out point values for obstacles on a numbered course. Numbered courses are predictable (after all) and any game that requires a judge to announce values lends itself to scribing error. Also, the original version specified that the dog starts and stops on a table. This is really a limiting requirement that we can ignore. Under the original variation the game would be scored Points, Plus Bonus, Then Time. What is the term (not English) suggesting that a film reflects the director’s personal creative vision? Questions comments & impassioned speeches to Bud Houston: Questions comments & impassioned speeches to Bud Houston: BudHouston@hughes.net. Check out my latest publication the Jokers Notebook ~ Dog Agility Distance Training ~ Issue #0 ~ August 2010 available on the Country Dream Web Store: http://countrydream.wordpress.com/web-store/ . Readers of my web log get a discount: Enter “special00” in the box for the discount code. And that will take $5.00 off the price of the order. On my way to a well choreographed few days full of plans and aspirations I managed to lose control of my Suburban in a bit of black ice in Indianapolis. I drove off the road, rolled over a time or two, and found myself an unplanned four-day stay at Methodist Memorial Hospital. It messed up my planning something terrible. I had a concussion complete with a few crude stitches. I’m home again; bent a bit, but unbroken. 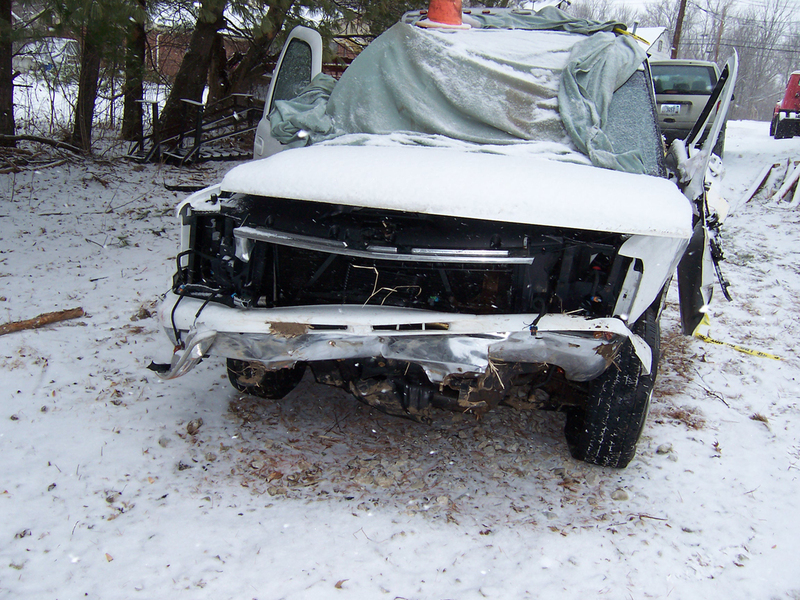 I am thankful for seatbelts; and that I did not have dogs in the car with me. I discovered that everything in the back of an open truck or van becomes a missile. Forgive me while I take a few days to heal my brain. Right now it seems the muscle most easily fatigued each day. Ohio State’s win in the Sugar bowl last night was sweet. I wasn’t terribly optimistic about the game. I really enjoyed it because it was a thriller to the last minute. I wish my dad were alive to watch it. Being an Arkansas boy and all he was a big Razorback fan. He used to tell me “they been playing football in Arkansas for more’n a hundred years” And it’s no exaggeration. Arkansas boys are strapping on a helmet by 11 and learning to hit other boys in the mouth. Football coaches in that state approach the game like they’re going to war. I continue my review of agility games below with Beat the Clock. It hasn’t changed substantially from how it was published in the Book of Agility Games, 2d ed. These days agility competitors and course designers alike are becoming wary of using the tire because at “today’s speeds” it can be perceived as a dangerous obstacle. The real problem of course is that in a dog’s choice game the course designer has little control over creating the square and safe approach to the obstacle. But then, when we play games that feature freestyle handling, the handler can become quite expert in becoming the architect of the dog’s path and fashioning the square and safe approach. Add to that the notion that we might teach the dog to square himself up for the performance of the tire… and some of the objections to this obstacle seem a bit weak. Beat the Clock has long been a favorite game in the U.S. Originally the game was used as a warm-up game in the USDAA; a simple, open-entry game in which novice dogs and handlers could compete with more advanced teams. These days Beat the Clock is a popular titling game in the TDAA. The objective is for the team to perform the clock of obstacles before the time expires. Typically, the standard course time is sixty seconds. 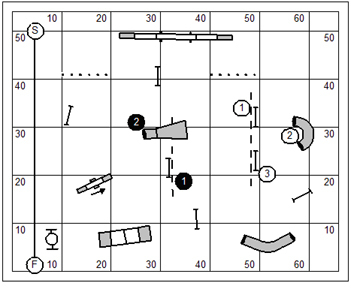 The dog and handler begin in the center of the clock where the dog must perform an obstacle that begins course time and then perform a quarter of the obstacles on the course (first #1 through #3; then #4 through #6, and so forth). The handler must direct the dog to the obstacle at the center of the clock-face prior to beginning each quarter of the obstacles on the clock. 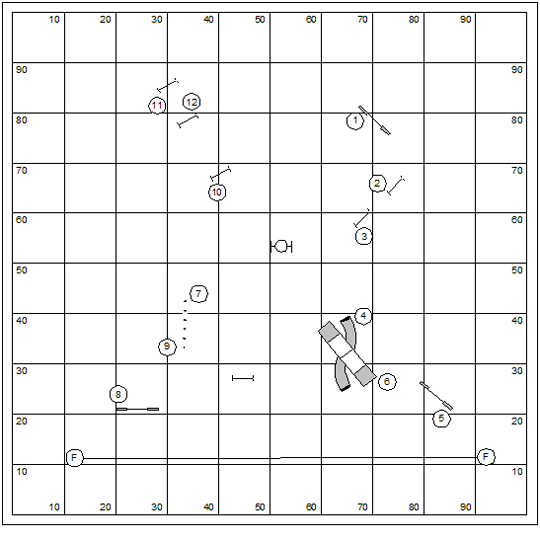 After completing the final sequence of obstacles, #10 through #12, the dog must be directed to the finish line or to a table, at which time the clock is stopped. After completing the #12 obstacle while the dog is on the way to the table or finish line to stop time, he’ll not be faulted for taking additional obstacles. If a dog faults an obstacle in a designated sequence, the judge will call “fault.” The handler must direct the dog back to the obstacle at the center of the clock face and reattempt the same sequence. Any points previously won in the group are lost. 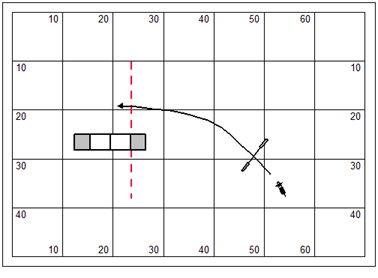 Faults are assessed for dropping bars, missing contacts, and taking an obstacle out of order (or from the wrong group). Refusals may be faulted at the discretion of the judge and course designer. Beat the Clock is scored points then time. The team earns the clock value of each obstacle successfully performed. The winner is the team who accumulates the most points and therefore has the highest score. If two or more dogs have the same number of points then time breaks the tie. Faulting an obstacle results in no points earned for that obstacle but the team can still continue on course. An off course results in an immediate cessation of scoring and the team must go to the finish line or table to stop time. A total of 78 points is possible. This is a typical example of a Beat the Clock course. 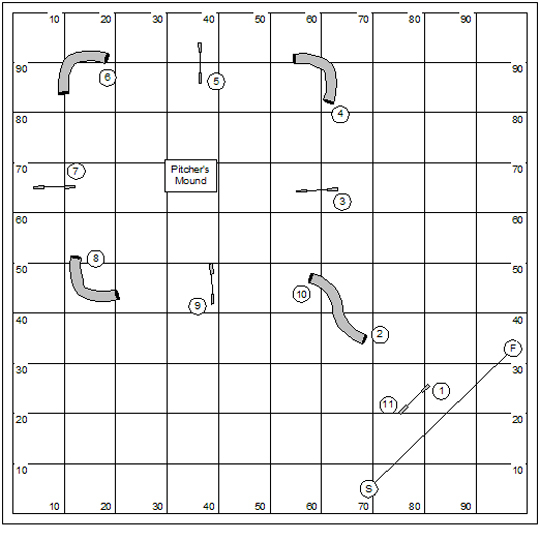 This course was designed by Bud Houston and originally played in the agility league at Dogwood Training Center in Ostrander, Ohio. A Beat the Clock course consists of twelve obstacles, numbered from #1 to #12. 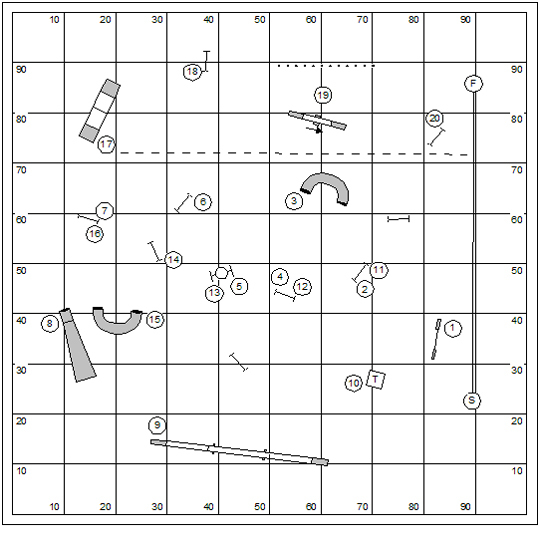 The layout is roughly circular with the #12 obstacle positioned at 12 o’clock and the other obstacles arranged in a clock-like fashion. Another possible design would be to create four quadrants which might each contain more than three obstacles. That would certainly make the game more interesting. The handler should find the sweetest path for his dog and push for as much speed as possible without sacrificing the reliability of the dog’s performance. The different variations of Beat the Clock offers greater opportunity for strategy and daring. 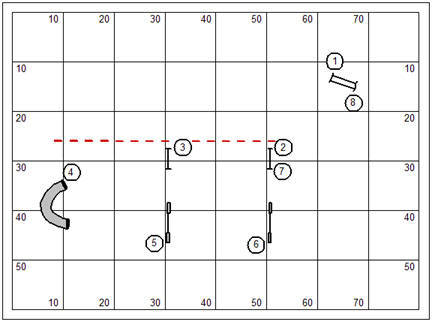 In the Cuckoo variation, the handler should carefully measure the length of his dog’s course. From this measurement the handler should get a pretty good idea whether it’s possible to complete the cuckoo and earn the cuckoo bonus points within the allotted time. During the run, if there is a bobble that takes any amount of time to correct, the handler might think very hard about abandoning the strategy to go for the cuckoo. In the Dealer’s Choice variation, the handler should carefully analyze each of the three-part sequences to find the most efficient line for the dog. Indeed, the tire should always be considered a fourth obstacle to close the three-part sequences. The handler should consider what kind of approach to the tire solving each of the sequences will give his dog. 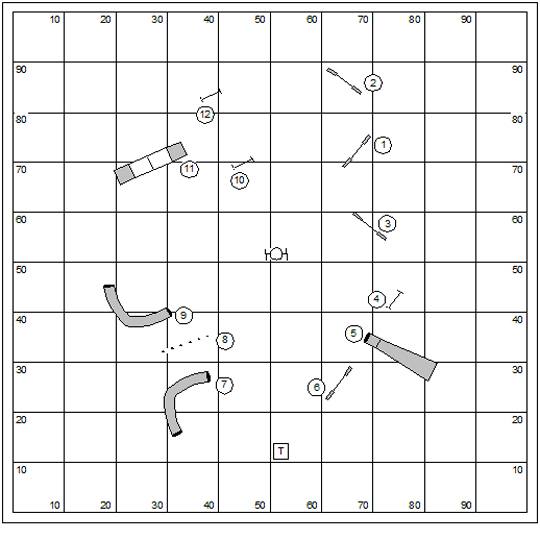 • Combination Obstacles – In this variation, combination obstacles might be used much as they are used in USDAA-style Snooker. A combination obstacle is when more than one obstacle is used to form a single obstacle for performance. This is especially useful when nesting courses for Novice and Advanced levels. 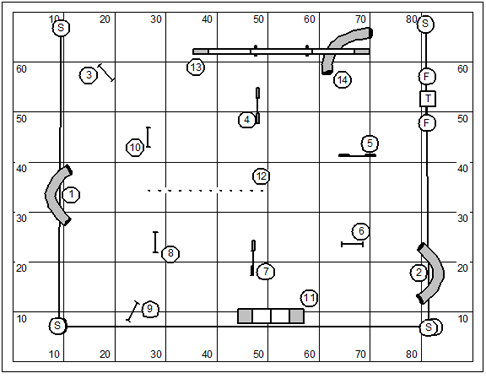 The more advanced competitors would have to do the combination obstacles while the Novice level competitors would use only a single obstacle out of the combination. This variation can be used with standard Beat the Clock or the Cuckoo and Dealer’s Choice variations. In the Dealer’s Choice variation, the judge may specify that the combination obstacle has to be taken in a certain order or direction. • Cuckoo – This variation of Beat the Clock adds a thirteenth obstacle to the clock. If a dog and handler have completed the first 12 obstacles and believe they have enough time left on the clock, they may attempt to perform the cuckoo. If the team completes the cuckoo within the original sixty seconds, then the team’s score is doubled. If the team attempts the cuckoo but fails to perform it correctly within course time, then all points are forfeited. This variation is credited to Gordon Simmons-Moake. When using the Cuckoo variation it is important to specify whether the dog must be directed to the obstacle at the center of the clock’s face before (or after) attempting the cuckoo obstacle. • Dealer’s Choice – This variation of Beat the Clock allows the handler to choose the order and direction of obstacles to be performed in the segments of the clock; and may allow the handler to choose the order of the segments themselves. In the Dealer’s Choice variation of Beat the Clock, the obstacles in each group may be numbered, but these numbers do not indicate the order and direction the obstacles must be taken. This is left to the handler to determine or the dog, as it were. In the Cuckoo variation, this might be changed to require the Master handler to go for the Cuckoo in order to win the higher games qualifier. • Games I – For a score of 9 or better. Who was the fellow that Deborah Kerr was supposed to meet on top of the Empire State Building? And an interesting follow-up question. What was the name of the Collie at that fellow’s grandmother’s house? I’ve been up since 4:00 am this morning. My usual wake-up is more about 8:00; but Kory was up pacing and I took him out. My mind started churning early about all the work I had to do. So I brewed a pot of coffee and got going with it and never did get back to bed. The Ohio Arkansas game is coming on in about a half an hour. I reckon that’ll keep me up for at least another three hours. I’m heading for St. Louis for the weekend to work on some TDAA business. Trying to get ready for that has me occupied. Today I backed up my computer; and spent a couple hours moving an old antenna tower that I’ll put back up here at the house next week. Rather than hoisting a television antenna it’s going to hold up an internet band receiver; which is more like FM radio I suppose. It’s funny that an anachronistic feature of the 1950’s has an application in the 21st century. Today I’m reviewing an agility game called “Basketball”. This is one of those not suitable for competition and titling games; and represents more of an interesting romp for a fun outing. Speaking of anachronisms… does anybody still have agility fun days? We’re all so serious these days. I gave this game the same kind of attention I’ll give all of the “serious” titling games. It would be fun to play; though I’m thinking I might want to go train my boy to stay for a fetch until I release him. That’s just like me… to lament the good old fun agility days… and worry over training my dog to be competitive in a silly ball tossing agility game. Basketball is the invention of John and Arlene Rhodes. The game was originally played on May 25, 2002 after the first fun match put on by Zippity Do Dogs Sports Club in Grand Junction, CO.
Basketball is a two-part game. The first part is the point-accumulation period. The second part is the basketball period where point scores can be multiplied. Please note, there are two jumps marked SD for “Sudden Death.” If the dog takes either of these jumps at any time, sudden death occurs and the dog must run to the table to stop time. The dog retains any score earned up to that point but cannot earn any more. To start, the handler must leave his dog on a stay behind the start line and then load two tennis balls on the table. If the dog breaks his stay and crosses the start line, the handler forfeits one ball and must repeat the loading sequence with only one ball. If the dog breaks again, he loses his second ball and cannot multiply his score by shooting baskets. Point accumulation –Big dogs will have 50 seconds to accumulate points; small dogs have 55 seconds. 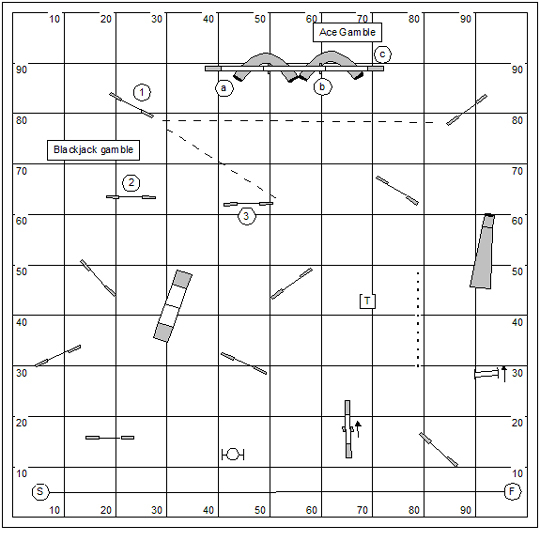 Time starts when the dog crosses the start line; after the handler has “loaded” the table. Points are earned for each obstacle the dog successfully performs. No more than two obstacles may be taken on either side of the court without crossing center court (the red half-court line). If more than two are taken, no points will be earned for the extra obstacles. Jumps are not limited in the number of repetitions. Other scoring obstacles may be taken no more than twice. During point accumulation, if the dog removes the ball or causes it to fall off the table, the handler must replace it before continuing. Point accumulation ends on the time whistle. The basketball game – If any tennis balls are left on the table at the end of the opening period, the team will have 20 seconds to shoot baskets. A basket is made when the shooter tosses the tennis ball though the tire. If the shot is behind the 2‑point line, the team’s accumulated score is doubled; from behind the 3-point line the score is tripled. Any tennis balls not forfeited in the opening round must be on the table when the basketball period begins. If both balls were forfeited the handler cannot multiply his score and must run to the table to stop time. If a ball rolled off during play or is carried off by the dog and the handler doesn’t replace it, the handler’s shot is forfeited. Also, the dog must be behind the 2-X line when the handler takes his shot. Otherwise the shot will not count and the score cannot be multiplied. It is permitted for the dog to be on the table, as it is behind the 2-X line; but the dog may not be on the table for the 3-X line. To stop the time, the dog and one ball must be on the table. The ball may be in the dog’s mouth or simply touching the table. If the handler chose to throw both balls available to him, he may have to retrieve one of the balls and bring it to the table to stop the time. The basketball round only multiplies the score; it cannot add any points. In this sample course the judge stipulated that the collapsed tunnel and teeter may only be taken one time each. Note both are performed in the same direction (toward the starting line). 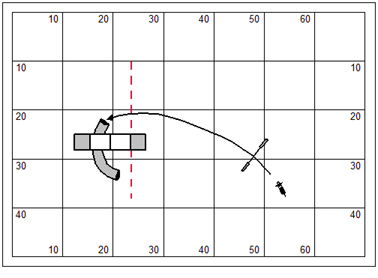 This presents quite a problem because the only other obstacles in the transition to the back of the ring are the Sudden Death jumps (end of scoring) and the tire (-3 points). The game can be varied by rearranging the obstacles. The arrangement of the tire and table are a required element of the game. The 2-point line is set at 7′ from the basket. The 3-point line is set 12′ from the basket. Just to save time, a ring steward could place the tennis balls on the table, rather than requiring the handler to carry them out to the table with the dog in a stay. Simplified Rules – There are several things to be done to simplify the rules of this game. This might not be a bad idea if it’s likely that a lot of rules make it hard for competitors to figure out exactly what they are supposed to do at any given moment. • Do away with the stipulation that a dog has to cross the “Center Court Line” after doing two obstacles on one side of the court. • Limit throwing the basketball (tennis ball) to one throw. The dog’s score is doubled if the handler throws the ball through the tire from behind the 2-point line. If he can then entice the dog to go through the tire to give chase to the ball, the dog’s score is tripled. In this variation of the game, there will be only one ball and one shot to the basket. There is no 3-point line. It appears to be a very good idea to throw the ball through the tire; and from behind the 3-X line if possible. Does this really sound like a strategy? Or, is it wishful thinking. Basketball is scored Points Then Time. Let’s be very clear ~ Basketball is not a game that should be used for titling purposes in any venue. The tennis balls add a complexity that creates a competitive disadvantage for certain types of dogs. And throwing the tennis balls can only lead to carnage and chaos. Name the pilgrim who got his only Oscar on (about) his 60th movie. Oh, and while you’re at it. Who was the young lady who won an Oscar for her very first movie the same year? I’ve worked on two games today. The second one actually is the set of the floor for our classes this week here at Country Dream. After I designed it I decided that it would make a pretty good Time Warp course. And so that’s the second game that I’ve worked over, down below. To tell you the truth my real objective was to get the broad jump, and a couple spread hurdles (double and triple) out on the floor. I have a USDAA trial in a couple weeks with Kory and Hazard. And since I have them both entered in the Dog Agility Steeplechase I thought it prudent to give them a good workout especially on the broad jump. Aside from the numbered course I’ve also designed a variety of sequences that put our dogs on these extending jumps. The fun thing about this USDAA trial (at BRAG in Columbus, OH), by the way, is that it’s a Starters/Advanced only trial. And they’re putting on the Steeplechase. You know what that means right? This is one of the USDAA’s most important tournament events… and the smart alecks will be staying away in droves. So I can bring in my young Starters/Advanced dogs (Kory/Hazard) and have a run at the Steeplechase with a diminishment in competition. I kinda like the sound of that!! Like the great American pastime, Baseball is a delightful just-for-the-fun-of-it game for a summer afternoon in a park with a band of agility enthusiasts and their dogs. This game is also a useful training exercise for modest distance work. Baseball is the invention of Terry Culley of Bosque, NM. The dog is required to perform the obstacles in sequence at the handler’s direction and in the order designated by the judge. Bonuses are awarded for each base the dog gets to while the handler remains on the pitcher’s mound. A home run may (25 bonus seconds) be scored if the handler leaves the dog in a stay at the start line, stands inside the area designated as the pitcher’s mound (roughly the center of the course), and remains on the pitcher’s mound throughout the dog’s performance. If the handler leaves the pitcher’s mound before the dog completes the course, the dog will be faulted, and no bonus subsequent bonuses will be earned. The game can be played in two ways, for individual scores, or the field can be divided into an equal number of dogs and handlers on each side for a cumulative score. Baseball is scored time plus faults minus bonus. The team with the lowest score wins. 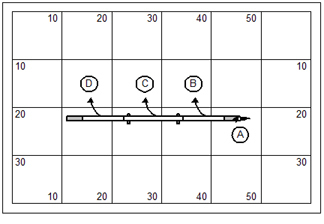 This is a relatively simple Baseball course, demonstrating the basic elements of course design. The course is diamond-shaped and flows around the pitcher’s mound. Notice that the path from the start and finish line (home plate) to the pitcher’s mound is a re-used sequence. It points toward the pitcher’s mound at the beginning of the course and straight away from the pitcher’s mound at the end of the course. Using weave poles as the bases is a bit more advanced. But it’s certainly not out of the question. Baseball is eligible as a qualifying game for TDAA and TOP SECRET Top Dog. 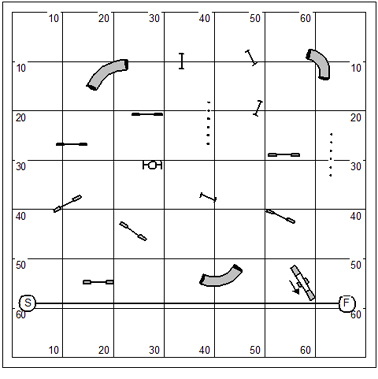 When using this game as a qualifier, a baseline for the standard course time should be established by the judge that reflects the yards per seconds in the Standard classes for the respective level of the dog. Qualifying criteria should be based upon rates of travel from the standard classes with some expectation of success appropriate to the level of play. When the handler steps outside the box, earning a 5-point penalty, the dog’s ability to earn a qualifying score is significantly affected, but not really eliminated. The Egyed variation – In this variation, invented by Cynthia Egyed, the table serves as the pitcher’s mound. Handlers must stand on the table. This is a fun club outing variation. If a dog takes the table, with the handler the handler will be required to run the course without his dog. The Tables variation – In this variation all of the bases are tables. The dog will earn a super bonus for demonstrating either a sit, down, or stand on each table (or, all of the above!) The qualifying criteria should be tweaked with some expectation of success earning a super bonus. The objective of Time Warp is to run all of the obstacles in a numbered sequence as fast as possible without faults and to turn back the clock by performing one or more Time Warm distance challenges. The performance of the table will be judge’s choice. Traditionally the dog will be required to demonstrate both a sit and a down, in either order. The handler simply continues when the dog has done these two performances. Thirty seconds are taken off the final time for each Time Warp distance challenge successfully completed with the handler behind the line. Therefore, there is a possibility for negative course times, hence the name of the game. Scoring is Time Plus Faults Less Bonus. Performance faults are identical to those in the standard classes with this exception: traditionally the wrong course fault is waived during the attempt of the Time Warp Bonus. A 30-second reduction in the dog’s time is awarded if the dog performs the Time Warp distance challenge while the handler remains on the opposite side of the containment line. Note: Avoid any convention that calls for a 5-point fault for stepping over a containment line. The dog is already penalized for failing the Time Warp distance challenge. There’s no good reason to punish him a second time. The handler should be very aware of the capacities and limitation of the competition. The game might be won by a dog that does not attempt the distance challenge but it is unlikely unless there is no dog in the field of competitors that will do the distance challenge without the attendance of the handler alongside. Moreover, the handler should trust the dog’s understanding the performance of the work at a distance, even if this performance has not been intentionally tested in the dog’s training program. The handler should be aware that a dog will nicely work in a parallel path to the handler’s path. The handler should seek a path of movement complimentary to the dog. The biggest mistake a handler can make in lateral distance work is to come to a stop and rely on the flapping of arms and jaw to direct the dog. As refusals are not faulted, the handler should not get mental if the dog should happen to refuse an obstacle. It is possible to recover from such an error and still place highly in this game. If the handler knows that his dog will not perform the Time Warp obstacles from a distance, it makes more sense for the handler to draw step over the line, run with the dog, and never mind making the attempt for the time warp bonus. This is a Time Warp course for Advanced competitors. This course was designed by Bud Houston for agility league at Dogwood Training Center in Ostrander, Ohio. The Time Warp course is based upon a numbered course; and so the course might also be designed as a Jumpers course. The course designer should consider giving the exhibitor multiple opportunities, as in this example, to warp back the clock so that if one failed the other would offer redemption. The Time Warp obstacle does not have to be the weave poles. However, the distance challenge posed should allow the agility team to demonstrate substantial technical merit. In the traditional Time Warp course the designer will seek a closing challenge offering a performance of the weave poles to the dog at a lateral distance from the handler. Time Warp is an eligible titling game for qualifying in the TDAA and in TOP SECRET Top Dog. In both, qualifying criteria for this game is left fairly to the judge’s discretion. Time Warp is scored Time Plus Faults Less Bonus. The simple qualifying criteria would be to set an aggressive SCT based on the rates of travel for each jump height from the standard classes. This raises the sticky issue that a dog might earn a qualifying score without any Time Warp bonus, and indeed, without even attempting the Time Warp bonus. The Multiple Challenges variation – In this variation more than one Time Warp distance challenge will be included in the numbered sequence. What is the real name of the neighborhood bar that was shown (outside view) in the television series Cheers? Where is it located? 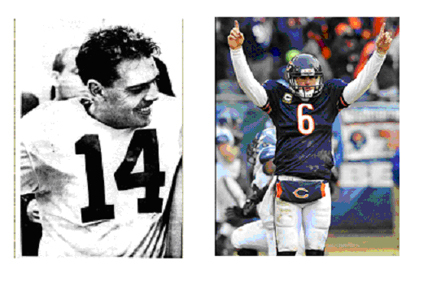 You are currently browsing the Bud Houston's Blog blog archives for January, 2011.